The moon was up and it was still dark as we set off for Ripon at 5.00am. 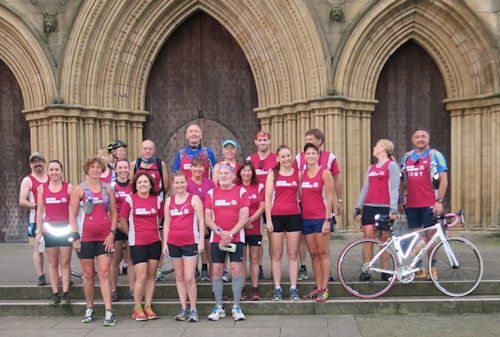 I was setting off for the annual Ripon Runners’ 30 mile run from Ripon Cathedral along the course of the River Ure and Ouse to York Minster, the Minster 2 Minster Marathon. Organised each year by Matt Holt with a willing roster of volunteer support teams. After a clear cold night there was a mist at the appointed start time of 6.00am but it promised to be a sunny day once it burnt off. I had paid to park at Sainsbury’s and set off to the all night loos, oh no! they were locked so tried the court house as the iron gates were open, it was looking good, but no those doors were also locked – no loo and it was nearly start time. I was expecting 17 runners plus me for the 6.00 am group which in 2013 had been me alone. Michael Bray was in support with Sue Grundy. Hilary and Julie arrived on their bikes, to ride the route with us. Other cyclists would join later but like the runners the cycling group has grown annually. Soon all of us were gathered for a group photo before setting off. Martin, Hayley, Phil, Tony, Mel, Robin, Simon, Jane, Jane, John, Jackie, Sam, Maggie, Chris, Clare, Helen, Angela and myself. 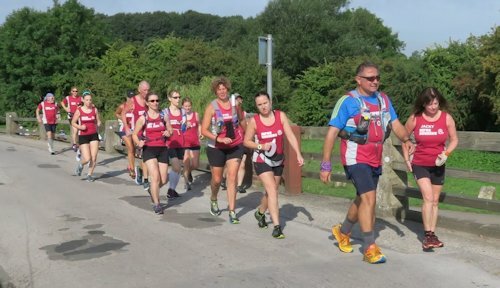 The first stage to Boroughbridge was mainly road with 8 miles of good running. 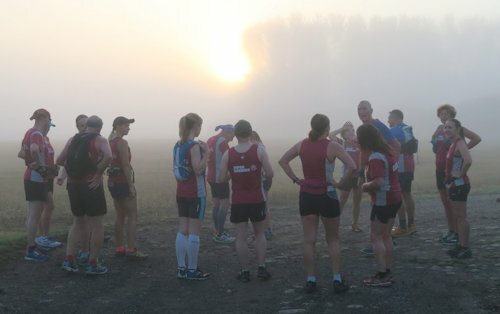 It was still misty and mysterious as we ran through Bluebell Wood (what I called it as a child) and then there was a cockerel, stood in the middle of the road, totally unfazed by 18 runners in burgundy vests running past at 06:30. It then proceeded to attempt to join us, chasing Mel. As we ran down the Newby Hall exit road a majestic barn owl flew towards us, landed in a tree, looked and flew off to the left. What a sight on a beautiful morning. Then as we turned into a track we were confronted with a stunning sight, the sun piercing the morning mist above the trees. The group ran around the wood, though the farm and into Skelton on Ure. Helen and Angela, our guests, had settled into the group well. As we got to Boroughbridge I got myself to the front so as to be first in the toilet queue! Now these were locked last year, but fingers and legs crossed as I tried the door expecting it not to move, it opened. Yey! we had loos! I was not the only happy person as a queue formed. 8 miles down and the first supported stop with Michael and Sue already in position with food and water. Some people changed trainers as the group was about to split into road and undergrowth sub groups! The undergrowth group ran along the flood defences for a while and initially it looked good then the Giant Hogweed was spied as well as a stile so overgrown that a high, barbed wire fence had to be negotiated. It looked as if the statuesque Hogweed was dying off, leaving its skeletal frame looming above the other invasive plant, Himalayan Balsam but I advised all on the dangers of touching the Giant Hogweed. For the four years that I have done this run the path here has not been clear, in fact it becomes more overgrown each year. After crossing the fence we had a couple of fields that were runnable in the past but we were faced by a crop of oats that had been flattened in the rains and now covered the path, We walked through, high stepping until we were out of that field, Our legs scratched and our feet soaked in the morning dew. The rest of the route was mainly overgrown and we had sections where it was really tricky avoiding the Hogweed, getting nettled and being scratched by brambles. We crossed the foot bridge and the metal bridge but walking because of the hidden hollows and undergrowth, passing through 3 or was it 4 fields? After a recce of the wrong exit field we found the route to the caravan site and tarmac road of Lower Dunsforth where the road group were waiting plus cyclists and the essential support team. That was probably the slowest 5 miles of the M2M! 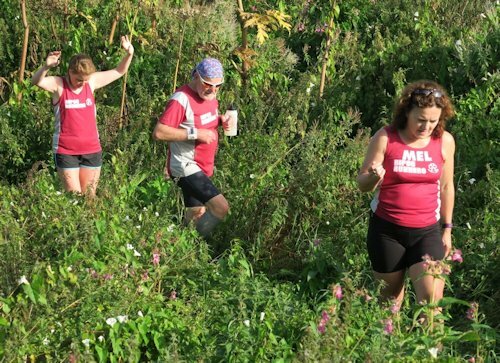 After more refreshments and trainer changing, I decided to give the next off-road section a miss as last year it was very overgrown, we also knew that the faster runners, who had set off at 7.00 am, would be hot on our trail! We set off for Great Ouseburn and then to Aldwark Manor Golf Course but first a road section, which was getting busier with more cars and cyclists. Our wet soggy feet dried out on way to the golf course but then were soon soaked again as we ran beside the dew covered fairways. Tony got stung by a wasp, Jane came to the rescue with some Antisan. We left the golf course by Aldwark Bridge. Jono, supporting the fast team, was already at Great Ouseburn when we arrived which meant that they were not far behind. Everyone was still in good shape, even those who had never done the M2M before so we set off on the next stretch. Four miles of long winding road with the sun beating down and reflecting back off the tarmac. By the time we arrived at Linton on Ouse we were being overtaken by some of the fast group but we soon arrived in Newton on Ouse to cheers. Here we stopped for yet more refreshments just, of course, so as to let the rest of the fast group catch us up! A short jog along the public road to the river side path, again very overgrown even though it appeared to pass through people’s back gardens. We enjoyed admiring the large houses with manicured lawns and boats on their private moorings. Our river side route was then past Beningbrough Hall, the water tower and pump house. The 6.00am and 7.00am groups were intermingled now, strung out in single file along the banks of the Ouse. Matt and Claire put in many extra miles constantly running back to any stragglers, encouraging them but never leaving anyone behind and particularly keeping Maggie company, after all she was celebrating her 60th!! What stars they both were. We emerged onto the cycle path near Rawcliffe Farm, Skelton, where all runners and cyclists met for a final rehydration and refuelling. Once ready for the final push we set off again, some taking the slightly shorter cycle path whilst the rest of us ran along the flood-defence embankment. The Minster came into view but appeared never to get any closer, then we were at the green rail bridge and the final track to Lendal Bridge. The end was in sight, faster runners came back to meet us, Maggie ran ahead to huge cheers and applause for completing the 30 mile run in celebration of her 60th. It started to rain, but we didn’t care, grouping together below Lendal Bridge we ran as a single phalanx through the traffic to the doors of York Minster. Total strangers stopped to clap and cheer us in and watched as we gathered on the steps with the cyclists and support crew for photos. All the first timers gathered together. Great achievement guys, just on 30 miles in under 8 hours, 7 for the faster group. My Garmin logged 6:48:57 moving time. The smiles say it all. 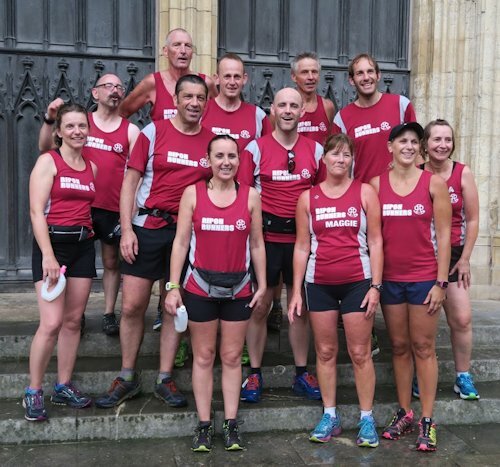 By this time we felt we had earned our visit to The Bay Horse, Marygate with our guest runners Angela from York and Helen from Bedale and Askew Runners. The pub loos soon filed up with wet, sweaty runners freshening up. Matt had arranged a function room upstairs which made for a great venue in which to unwind and relax with fellow 30 milers. Food orders were placed and soon everyone was fed. Thankfully it was but a short walk to the coach, colour Burgundy, how very apt. A huge thanks to Matt and Jill Holt for organising and the support team for keeping us fed and watered. It proved to be another fantastic day out with more Ripon Runners participating than ever before.